E-waste can be safely disposed off instead of sending to landfills. 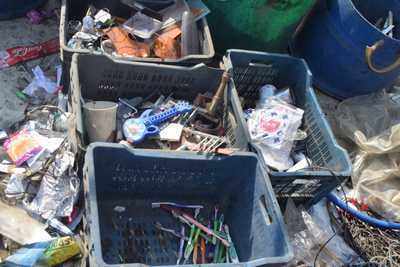 NGO Karo Sambhav is working closely with other non-profits, schools and colleges to get rid of e-waste safely. With an increase in global warming and pollution in the world, the race to save the environment is increasing. People are trying to find ways to reduce waste, especially highly toxic electronic waste: from used mobile to broken laptops and batteries. Many countries in the world have adopted proper practices of disposing this waste, but India is still grappling with introducing proper ways to dispose of e-waste. E-waste is the most harmful category of waste. It includes batteries, computers, TVs, monitors, cell phones, etc. Since we are in a digital age, the quantity of e-waste is huge. Harmful toxics like lead, mercury, and cadmium released by electronic devices goes straight into the soil and water. The same soil and water is used for irrigation purposes by farmers and when humans consume that food, there are chances of getting poisoned by these harmful heavy metals. The biggest hurdle is segregating e-waste is that it’s labour-intensive and expensive to boot. Now, the government has woken up to this problem because they know what impact e-waste can have on the world, if not controlled. Consumers should know that e-waste is illegal to dispose of the landfills. Those who are aware tend to keep it at their homes as they have no clue what to do with this type of waste. Karo Sambhav, a non-profit organization, has studied the problem andhas come up with an effective way to collect and dispose this waste. It’s a Producer Responsibility Organization(PRO) which only deals with e-waste. Their aim is to make recycling a way of life. They collaborate with various NGOs, schools and colleges to spread awareness and tackle this issue. The organization has also launched their mobile application which teaches you how e-waste at home can be disposed of easily. The main objective is to safely dispose e-waste. Founder of Karo Sambhav, Pranshu Singhal, says he has a dream of a sustainable and systematic transformation of India’s e-waste sector. According to him “The problem of e-waste is only going to grow exponentially. It’s important to engage with the issue because the problem cannot be solved without a behavioural shift on how we treat e-waste.” With an end-to-end value chain for management of e-waste and by engaging citizens, MNCs including Apple, Lenovo, Dell and HP, Karo Sambhav has successfully kept 2,91,310 kg of e-waste away from landfills.